Adam Doster’s excellent post to the Classical about Chicago’s regional variety of softball got me thinking about the regional baseball-related game popular in my neighborhood growing up. Throughout high school and college summers, my friends and I played hundreds of stickball games. Some summers, before stuff like jobs and girlfriends got in the way, it seemed like we played nearly every day. We played other sports too, of course — basketball sometimes and pickup tackle football pretty often. But those typically required more guys or more effort than stickball, our default outdoor activity. 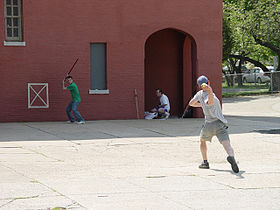 There’s some stuff on the Wikipedia about stickball, but it includes descriptions of varieties we never played. Our version is what the Wiki deems “fast-pitch stickball,” requiring a spray-painted strike zone on the side of a school building. We played with a wooden stickball bat — available at the local sporting-good store — and a tennis ball. The balls and strikes rules are the same as regular baseball, with no limit on foul balls or foul tips. Because games were typically 3-on-3, 2-on-2 or even 1-on-1 in lean times, there was no baserunning. Ground balls fielded cleanly by the pitcher were outs, as were any fly balls caught by a fielder. Ground balls past the pitcher were singles, and doubles, triples and home runs were distinguished by predetermined landmarks at each field. At the place we most frequently played, my old elementary school, doubles were anything on the gravel area built around the playground, triples were past the playground, and home runs — which were more or less impossible — were past the soccer goal on the field behind the playground. The game emphasized the pitcher-batter matchup, even more so than real baseball. Plus if it’s a 2-on-2 or 3-on-3 game, you get to hit and pitch much more often than you do in a regular 9-on-9 baseball game. Most of the time, I played with the same rotating group of 8-10 guys, so we developed pretty keen scouting reports on each other. One guy, who was the best pitcher on our high-school’s baseball team and could touch 90 with his fastball, was the only one capable of intimidating hitters with a tennis ball. One guy threw a sneaky curveball on both sides of the plate. Another guy had great control but reliably threw first-pitch fastballs down the middle that you could sit on. I honestly don’t want to get into more detail even now for fear I’ll give something away for some future game, even though we haven’t played in eight years or so. As recently as a few weeks ago at a bachelor party, several of us were sharing notes on the guys that weren’t around. I sucked at pitching, relying on a crappy slider and a loopy curveball that often got too much plate. But I developed into a decent wrist hitter with a good eye, the best way to succeed in stickball. Also, because the strike zone was painted in the crook of the L-shaped elementary school field and everything that hit the side wall was foul, pulling the ball provided no benefit. And something funny happened. I quit baseball after Little League because I wasn’t very good and took up lacrosse for a while because physically violent sports better suited my body type and mentality and because it seemed like a better way to stay in shape for football. I played stickball religiously, but didn’t try baseball again until I joined an 18-and-under travel team with some friends. By then — and I am sure it was because of stickball — I could hit a bit, leading the team in OBP and finishing second in batting average. I am sure it was because of stickball because I hit almost everything right back up the middle — either a groundout to the pitcher, a single through the hole, a fly out to the center fielder or an extra-base hit over his head. I’ve been playing baseball in Brooklyn for six years now, and it took me at least the first two to start pulling the ball with any regularity. Also, I still want to play stickball, almost always. Old habits die hard. Notable area stickball alumni include Taking Back Sunday drummer Mark O’Connell and ESPN host Kevin Connors. Everything even resembling baseball is pretty awesome. What version did you play? This entry was posted in "Sports", Baseball, Other Baseball, Words by Ted Berg. Bookmark the permalink.